Man, what a fast drive west! 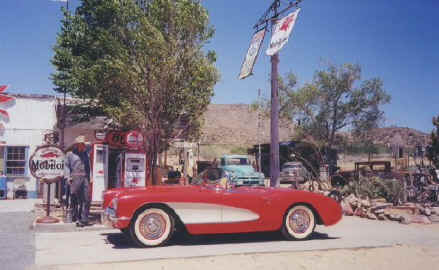 Time just flies by on Route 66. After Dad leaving Florida to drive 14 hours to Maryland, after nine days on the road, we finally reach the point of return. We decided to end our trip west at the end of the Mojave Desert in Ludlow, which for me, still retained alot of the 66 "atmosphere" that I crave so much. I really didn't want my last image west on the Mother Road to be that of "progress". I like to think that I concluded my trip west with an visual image that many travelers had in the sixties, fifties and forties. But, the time came to turn around. We headed back on the (gulp) dreaded Interstate, to Kingman. Driving east I was really bumming out. After all, this is a trip I have waited to take for almost twenty years! Heading back on the Interstate, I was happy to see a few handmade signs advertising a few 66 places along the highway. Only problem is they had slogans like "Daggett Restaurant, turn right, just 6 miles off the Interstate". Hey, advertising is good, but I wondered just how much good it did to those in a hurry to get everywhere. Back in Kingman, we had another night in the same motel. ROAD TRIP TIP- In Kingman, we stayed at a motel whose buildings were laid out horizontally to 66, and thus the large glass windows caught the direct line of the sun. It was a sweltering hot day, and the air conditioner just couldn't cut it. That's when I looked at the other motels and noticed that they were laid out VERTICALLY to 66. The reason being is that it provided more insulation (I guess) from the sun as it beat down on the buildings. Our motel, all glass, was in a straight line to the afternoon sun. Day Eight - Kingman to Flagstaff. Eastbound. Getting up and ready to head east again, we stopped at the Power House in Kingman, home of the Arizona 66 Association Gift Shop. I would suggest a stop there. Lots of good trinkets. Upstairs, you'll find a nice shop selling western gifts and really good prices. A good place to shop for a gift for your wife! Across the street, make some room in your trunk, because you MUST take home a six pack of MR. D'S ROOTBEER, available only at Mr. D's Diner. They have the best root beer in the entire world, trust me! Rolling into Hackberry, we found the General Store CLOSED! Closed on the way out, closed on the way back! What's up with that? We headed back to Kingman until I could get a cellular hookup on the phone and we called. Seems the new owners are still working on the place, so they're out alot. CALL before you go, just in case. Dad and I met the new owners who were really nice folks. They have been working on the General Store, to give it a retro atmosphere, which they are succeeding. They have laid down a black and white checked floor in a section of the place, added vintage gas pumps to the front. That struck me as ironic, as Bob Waldmire had to have the old underground gas tanks removed! As the pumps are now installed, the rock garden that Bob put in is now sadly gone. But, I am happy to report that his influence is still felt there, as there are many nature trails and signs, etc. still keeping Bob's spirit alive. Bob Waldmire left the place due to the progress, and I can understand that. I was out there in '98 and observed many beautiful rocky structures half gone due to rock quarrying. Now many are completely gone! Still, if I lived out there, I would have a hard time leaving. We rolled back thru Seligman, and had another incredible chorizo burger at the Sno Cap. You must stop there too! After heading out of Seligman, we were back on the Interstate for a while until we turned north to head to the Grand Canyon. It took about an hour to get there, but what a sight! I had been there in '91, this was Dad's first trip out. He really thought that it was spectacular. He must have taken two rolls of film in ten minutes! I had read of all the thousands of tourists heading there, and how the Park Service was going to limit hours and cars heading in and out. We arrived just before sundown and saw a beautiful sunset on the canyon walls. I was really surprised to find the place virtually abandoned. Our night ended after the long drive back to Flagstaff. Before leaving Flagstaff, we stopped off at the grocery store for provisions. I found a copy of HIGH PERFORMANCE PONTIAC on the news stand, with a cover story celebrating the anniversary of the Pontiac GTO. It really made me wish we'd have taken my GTO, but I know with no air conditioning, there would have been places that we would have been absolutely miserable. Not to mention those places that we would not have been able to go, or would have turned around after going halfway there, had we been in a classic car. Heading out, we stopped off at Meteor City (2000 update - now closed) on the way East, spent an hour chatting with the owners and we were off again. (hey, if you're looking for a retirement business, I understand Meteor City is up for sale) We took our time, wandered off the Interstate here and there, and continued East. Our night concluded with another stop at the incredible Blue Swallow Motel.